The Historic Centre of Shakhrisyabz contains fine monuments from the Timurid period (15th century). It was the non-formal capital of the Timurid Empire, the family seat and a city of culture and knowledge. "Shakhrisyabz" is Persian for "Green City", as it is located in a fertile valley. Unlike Samarkand, the town has preserved its original town plan. The master piece here is the Aq-Saray Palace. It was founded in 1379 when Timur captured Konya Urgench. Masters and builders from all over the empire were sent to work at the mosaics and construction of the palace. Its towers reached a height of 50 metres. Shakhrisyabz originally was not included in my group tour of Uzbekistan, but of course I found my way there. I hired a taxi that took me to Timur's birth city in about 2 hours. It's a fine drive along papaver fields and across a mountain pass. Locals sell the ubiquituous Uzbek bread and rhubarb by the road side. The city itself is worthwhile not only for "completing" Uzbekistan's 4 WHS and the main Timur-sites, but it also presents them at a much more human scale than Soviet-style Samarkand. Shakhrisyabz is quite small and the monuments are scattered along its main street. I started at the Aq Saray palace, the most iconic place in town. Behind a grand statue of Timur lie the remains of his former summer palace. Its two towers, the only large structures left, are enormous. Their blue glazed tiling looks weathered, but that also adds to the original/non-restored feel of the site. In front of it some floor mosaics have been uncovered. At the center of the town, amidst modern structures, are a caravanserai and bazaar that also originate from Timurid times. The main road then culminates into the complex of the Kok-Gumbaz mosque and Dorut Tilyovat. The interior walls here are not covered by mosaics but by frescoes. They are in quite a bad state, paint is peeling and parts of it look like reproduction wall paper. The motifs have a different colour scheme from what I had seen at Samarkand: here it is mainly blue on white. They are said to be inspired by Chinese porcelain. Behind it is another large and half-restored complex: the tomb of Jehangir. It is remarkable to see that these 14/15th century buildings are much taller than the rest of the (new) town. In comparison they look like skyscrapers - a remembrance of the splendour Timur gave to Shakhrisyabz and the decay that followed. I visited this WHS in June 2017. The 'iconic' picture with Timur standing between what is left of the Ak Saray Complex (14th century - top left photo) is the starting point of most visits from tourists and locals alike. All the sites of this inscription have recently been resprayed in a golden colour with black letters. Unfortunately (or deliberately? ), the UNESCO symbols on each sign are barely visible as they have not been filled in with black. Perhaps this was done on purpose, knowing that the site could be be delisted or else it's a coincidence. The mosaics and turquoise tiles with Koranic script on the remains of the palace (which used to be higher than the Kalyan minaret in Bukhara!) are worth the effort to get here. All the sites are now in a sort of open-air museum/garden with a partially reconstructed wall on one side and the panoramic mountain landscape in the distance. From Ak Saray to the other cluster of sites, I took a small electric cart (just a few som) instead of walking in the desert-like heat. The next stop was at the Dor At-Tilyavat Complex with the Kok-Gumbaz or Blue Dome (bottom right photo), a madrasah, marble tombs, and the mausoleum of Shams Ad-Din Kulyal. After that, I visited Dor-As Siadat or House of Power with its peculiar conical shaped dome (bottom left photo) which is now surrounded by a well-kept garden with places to sit down in the shade (top right photo). It's interior blue tiles are worth visiting. Opposite this site, there is the intricately carved crypt of Amir Temur with a huge stone sarcophagus. Next to it there is the Hazreti-Imam Mosque still used as a district mosque nowadays. Just a short walk away is the Chorsu, a large medieval trading construction or covered market quite similar to the Chorsu trading passage in Samarkand and the trading constructions with domes in Bukhara and Khiva. Even though the destruction of the 19th and 20th century buildings was heavily criticised during this year's WHC, I still believe that this WHS should remain on the WH list. The few Timurid remains are not comparable to Uzbekistan's 'big 3' (Khiva, Bukhara, Samarkand) but they are still better than the ones in Turkmenistan or other tentative sites along the Silk routes. Moreover, in my opinion the OUV of these sites lies in the Timurid remains and NOT the 19th-20th century buildings. The same is true in Samarkand - almost nobody visits the more modern inscribed sites and I don't blame them either. Shakhrisyabz already receives far less tourists than the other WHS in Uzbekistan and it is the only one not connected to the efficient railway system. I'm not in any way justifying what Uzbekistan did, but in my opinion it would be a pity to delist Shakhrisyabz and in the long run it might contribute to further concentrating 'crowds' on the Samarkand-Khiva axis. 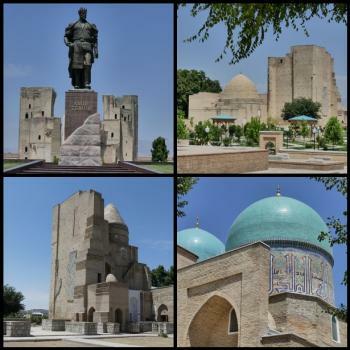 Shakhrisyabz or Shakhrisabz is a small but lively town with many monuments related to the lives of Tamerlane, the national hero of Uzbekistan, and his family. Contradict to previous reviews; Shakhrisyabz is now a part of the main tourist route of this country as a lunch stopover between Bukhara and Samarkand with few hours for monuments sightseeing, so Shakhrisyabz is developing to serve tourism industry. As mentioned Shakhrisyabz is related to Tamerlane as his birthplace, his home and hoped to be buried here, and the main tourist attractions are the ruins of Ak-Saray Palace, the mosaic here are the real jewel of Timurid art, Kuk-Gumbaz, which is the Friday mosque of the city with unique soft white tone interior, and Khazrati-Imam Complexes, planned to be a burial place of Tamerlane in the crypt. Shakhrisyabz is also the capital of Uzbekistan wedding, when I visited Shakhrisyabz in summer, the wedding season of Uzbek, the Tamerlane statue in front of the Ak-Saray Palace was the prime wedding photo shooting place of almost ten couples and the surrounding restaurants were in full swing of wedding parties, my guide informed me that the town catered at least 45 couples per day at the moment! Going to Shakhrisyabz is a real rewarding as the town is the place to admire local Uzbek people and culture and its bazaar is just great. Also the route from Samarkand is absolutely breathtaking along the Fan Mountain; however, Shakhrisyabz is not in the same league of Samarkand, Bukhara or Khiva in terms of grand monuments, and in my opinion, this place is just a fine WHS, actually the Uzbek wedding culture is maybe more interesting than the city itself. I encourage to any person who is in Samarcand or Bukhara, to take the road to Shakhrisyabz, the last time I went there is may 2006. I like the blue mosque, the rests of the palace (by the way, I was surprised to find "new" rooms which have been discovered since the last time I went there), and the tombs and mausoleums, but what I like most in Uzbekistan is the people, they are wonderful. It is easier if you speak russian, but it is possible (not expensive, but you have to bargain) to get any person with a car to take you anywhere. I recommend to take a local guide to explain you about the place. I have entered your page hoping to find more information about the tombs and the art, can you recommend me any book or internet page?. I live in Moscow, although I'm Spanish, and I've been 7 times in Uzbekistan (3 of them in Shakhrisyabz), but I can not find much literature on the theme, I only have the guides' tales and some books. The “standard tour” of Uzbekistan will take you to 3 WHS – Samarkand, Bukhara and Khiva. Unfortunately the direct route (6hrs by bus) from Samarkand to Bukhara misses out the country’s 4th WHS – the historic town of Shakhrisyabz. If you have your own transport you can fit in Shakhrisyabz and still get between Samarkand and Bukhara in a day - around 1.5 hours to Shakhrisyabz, 2 hours to see the town, another 2 to Qarshi and then another 3 to Bukhara. By bus would need 2 days. So, is Shakhrisyabz “worth the detour”? It was the home town of Timur (Tamerlane) and most of the sites date back to him or his grandson Ulughbek. 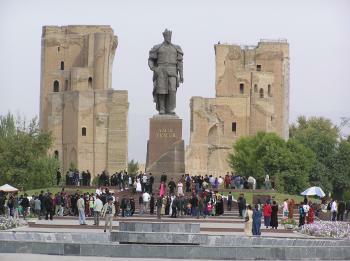 Timur himself has been resurrected since Uzbek independence as a great Uzbek hero after years “in the doldrums” under Soviet rule and an enormous statue of him dominates the town. 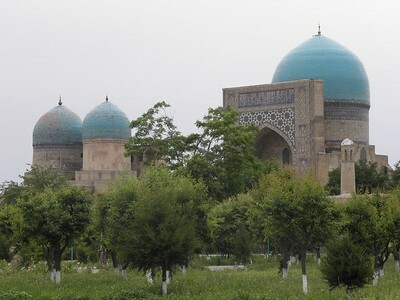 The town has a number of blue domed mosques and mausoleums. Unless you are an expert in Islamic architecture or Central Asian history you will probably not get a great deal more “value” out of Shakhrisyabz’s sites compared with those of the 3 other WHS towns. Shakhrisyabz doesn’t exude the history and “mystery of the east”of Bukhara and Khiva or have the magnificence of Samarkand. It is however much smaller, much less frequented by tourists and in essence much more “Uzbek” than these places. In my opinion if you do have your own transport or are not short of time it is worth the extra effort to take it in. Bureau - for buffer zone etc and material relating to its merits in comparison with other central Asian cities (Samarkand, Bukhara, Herat, etc.). At WHC the Uzbek rep expressed concern at this and was promised that it WOULD be looked next year! Mosque: Kok Gumbaz Mosque: A Friday mosque built in 1437 by Ulugh Beg in honor of his father Shah Rukh, its name meaning ?Blue Dome?.